What is the best restaurant in a Disney park? Some say might say Le Cellier, or Be Our Guest, or the Brown Derby. 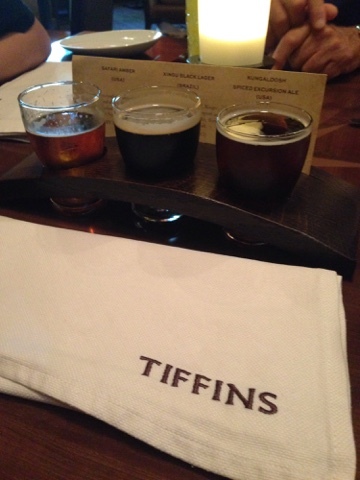 But there is a new contender to that title: Tiffins. Tiffins is an English Indian word meaning a portable midday meal. A fun name, but not really applicable as this place is fine dining. By Disney's definition its a signature eatery, meaning the prices are quite high and the food quality should be equally as high, and frankly, it is. 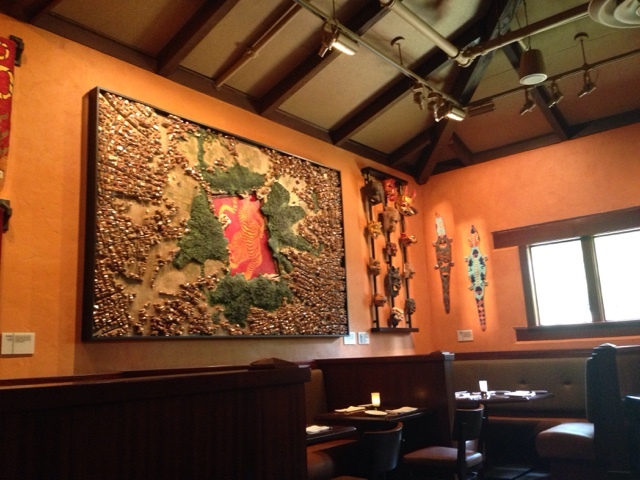 The restaurant is on par with other similarly priced places like Artist Point and Jiko. So what's the theme? Well, according to a post near the front desk, it celebrates the art of travel and culture from the places that inspired the Animal Kingdom. 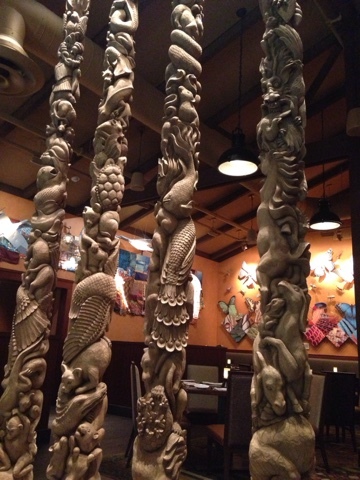 It's sort of a hodgepodge of culture and cuisine which is reflected not just in the decor but also the eclectic menu. Let's talk drinks. The adjoining Nomad lounge serves a bunch of interesting specialty drinks including the Kungaloosh spiced ale, seen at the bottom right as part of a beer flight I recommend. The kungaloosh is a spiced brown ale that is very good. Xingu is a black lager from Brazil, a great beer, and, of course, Safari Amber. There are three rooms, all with a different theme. There is the Grand gallery which is the largest room and the one most often pictured. 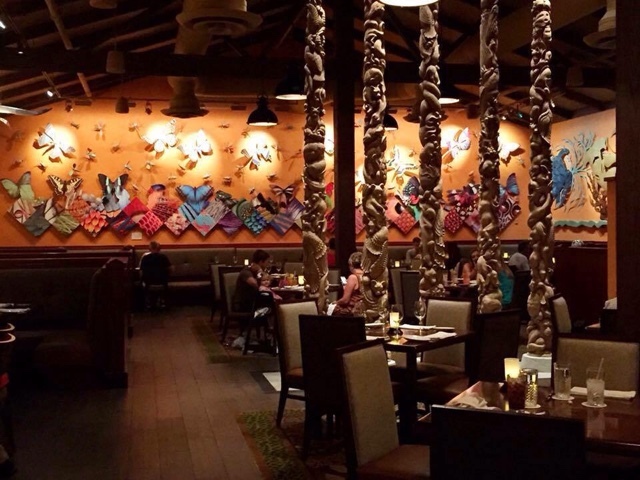 Like its name, it is grand in design, with beautiful artwork on the wall, like below, totem poles and a wall of lanterns as a nod to the upcoming Rivers of Light show. 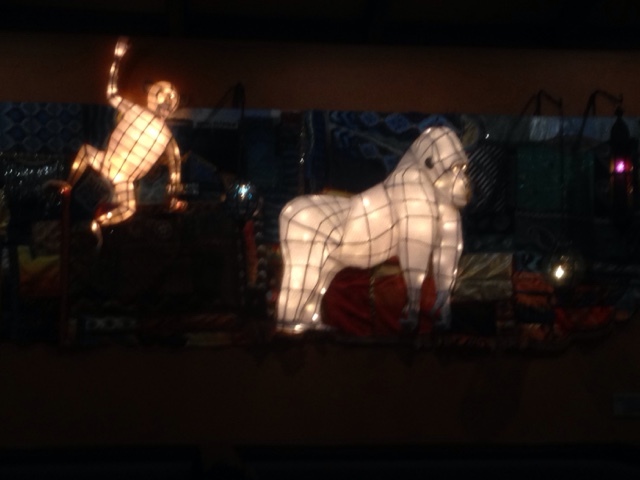 The safari gallery harkens back to the days imagineers researched the design for Harambe. 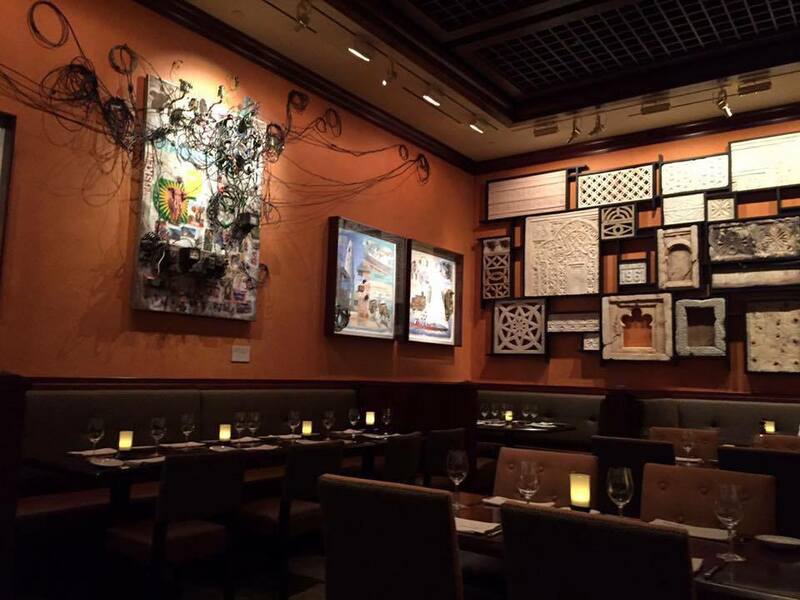 The artwork on this gallery's walls are directly from Eastern and Southern Africa. Make sure you check out the baobob trees and shadow boxes. Finally, there is the Trek gallery. This room takes it cue from the research that went into designing Anandapur. 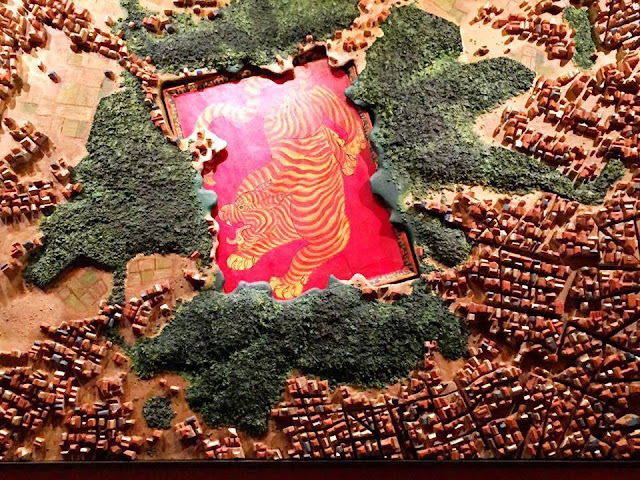 The art work comes from Bali and the Himalayas. 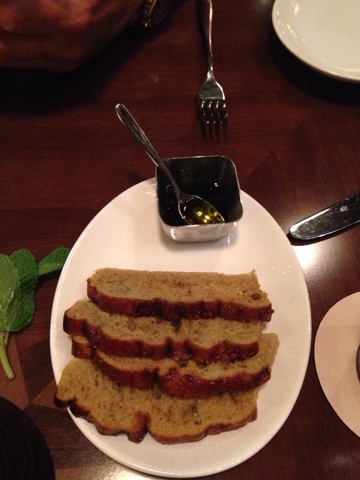 Meals start off with this delicious bread. It is a pomegranate focaccia bread with a molasses olive oil to drizzle. Its simply amazing. As was the service. Our waitress, Kelly, was absolutely terrific and that appears to be the norm here, which in fairness, you would expect for a signature dining experience. I mentioned before that the meals are quite pricey. Some entrees are priced over $50. But there is a better way to enjoy much of the menu here. I have to recommend the Taste of Tiffins lunch. This allows you to try 2 of the entrees (not all of which are on the special menu) with a side of jasmine rice for less than $30. I recommend getting a late lunch, say 2:30 or 2:45, and taking advantage of this option. 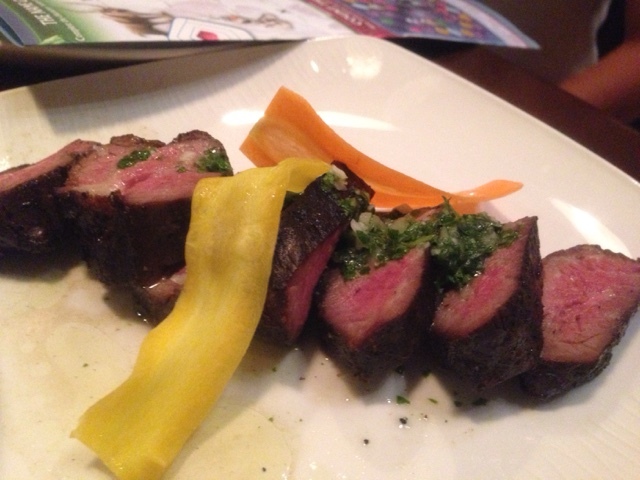 I had the short rib above which, to be honest, was a bit on the tough side, but did have good flavor. The chimchurri was particularly good with this dish. 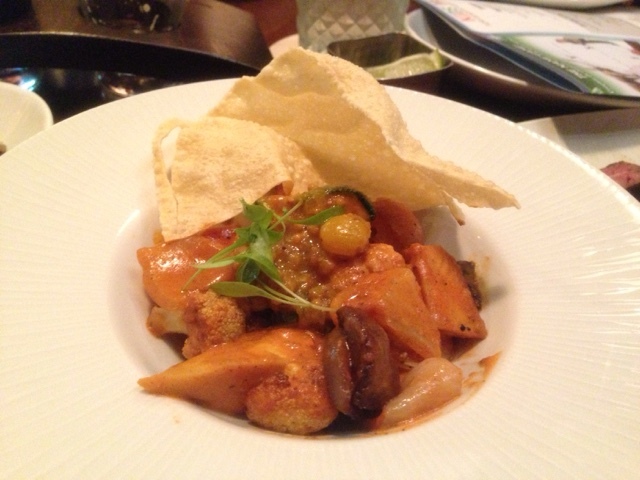 The market vegetable curry, however, was fantastic. The coconut red curry and lime chutney were spot on. I would order this all day, every day. 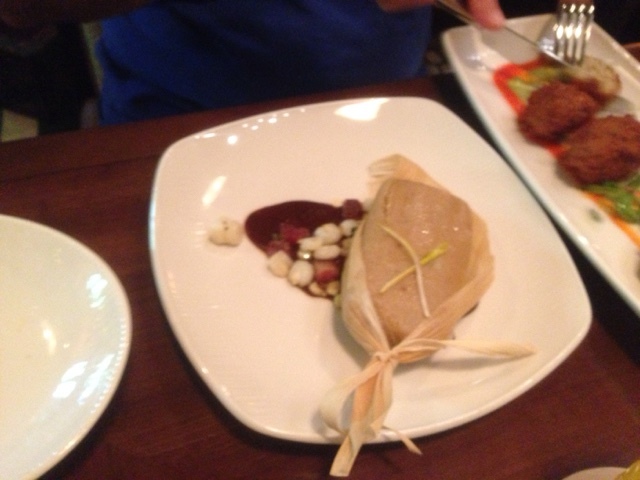 I would also recommend the pork tamale. The pork had a nice, subtle spice and nice flavoring. The side of succotash with red mole sauce was perfect. My son was also a big fan of the seasonal fish choice. Maybe the best part of the meal is your gift. 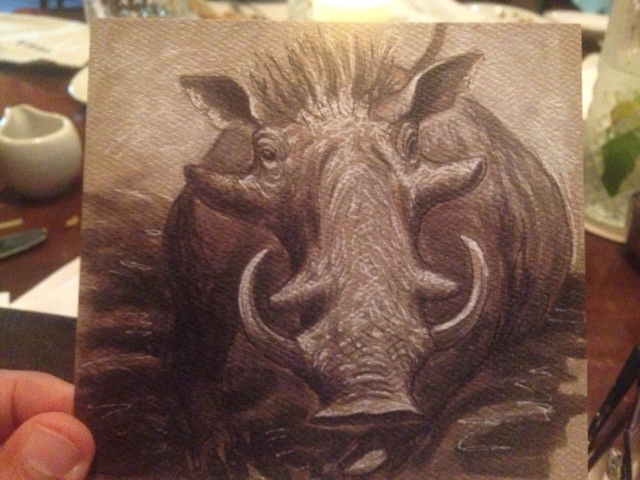 A piece of artwork from Joe Rohde himself, who designed these specially for Tiffins. Joe designed 12 different pieces, though at some point there may be as many as 16 options. I plan on going enough to get them all. 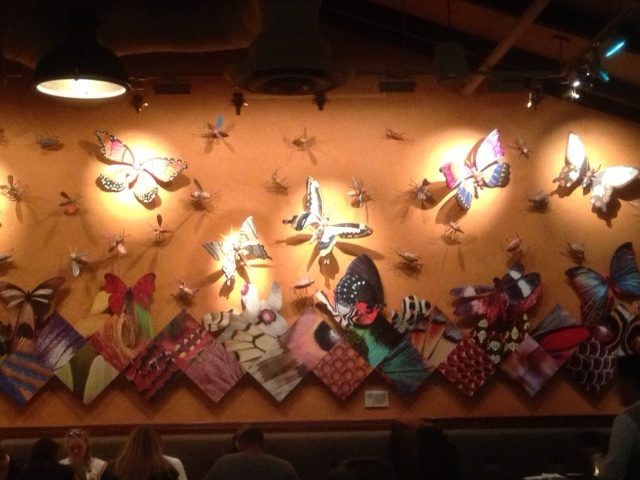 In any event, a new table service eatery at the Animal Kingdom was really needed. 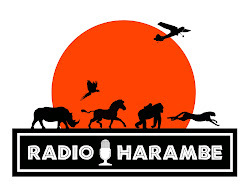 We have been stuck with the Tusker House and Yak & Yeti as our only options for some time. (I don't count the Rainforest Cafe). I am concerned that there will be a change to the menu. Its definitely different and the place was empty when we were there. I think this really stems from the fact that the path its on is currently a dead end, which will change when Pandora opens. I'm running my first (and only!) full marathon at Disney in January. We decided to book a dinner for after the marathon was a celebratory meal - my husband said I could pick any place I wanted and I went with Tiffins. I haven't tried it yet but I'm so excited!